Every time I start talking about getting a tattoo, my friends would said, "OMG, really? Is it a permanent one? ", "Are you kidding? ", "Seriously? like permanent?" and so on. And then they'll ask, "What kind of design you want", "What is the meaning of that design?". I wanted to get a tattoo since high school. If people ask why did I want a tattoo, I then set my self in silence because honestly I don't know why, I just want it because it's a pleasure to decorate your body with art. It's like when you love someone and your friends ask the reason why you love that person. Since a year ago I've asked a lot of information from experienced friend about which studio that I can visit to create my first tattoo. Then it comes when I contacted my cousin to accompany me. 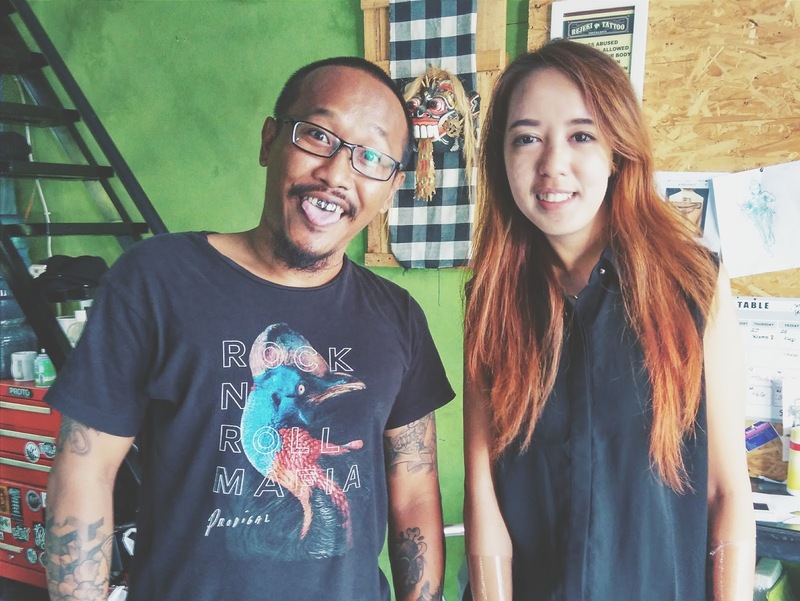 He referred me to go to Rejeki Tattoo, his first studio to get his first ink too. Since the excitement to get first tattoo is high, I wasn't really feel the pain of the tattoo needle. But the artist said that the place I placed my tattoo is on the less pain area. Before inked, the artist will ask whether we have had a lunch before or not, because some people may not be able to hold on the long pain they got by the inked process. Since my design is simple and just lining without shading, the artist said I will be okay without having lunch before. As my friend said, my design done in less than 15 minutes, and yeah, welcome to the ink world! Though the artist said that to feel the real "ink" is by create the tattoo with full detail and shading, he said that this kind of tattoo can't be underestimate too. In a big amount, this kind of tattoo can be so painful. I now understand how some people can be so addicted to tattoo and have a lot of ink on their body. After got 2 inked spot to my hand, I really want to have another. LOL. Next month maybe, after I decide the design. Look how happy I was after getting my first ink done. Sketch your design first, better to prepare it 1 or 2 weeks before. Keep it in mind that this tattoo will remain forever on your skin. In my case, I first design it in my computer and printed it, then put the printed paper in my make up mirror so that I can see it everyday. If after days you don't bother by the design, take it! Don't mind with expensive price for a tattoo in studio. I believe every legal studio have their standard price for the sterile needle and safety, and better tools. My cousin also refer me to his friend tattoo artist who inked freely at home, he offer a cheaper price. But since this is my first ink, I don't want to take a risk by taking unqualified tattoo artist. Think wisely to where you placed your tattoo. If you are a programmer or freelancer like me, have a tattoo in the open area may not give you a lot of trouble. You may consider to place it on the hidden area if you haven't ready to reveal it to society. Always ask the artist about the guidance to take care of your tattoo. The artist always cover your new inked with bandage made of plastic, and ask to keep it for around 3-4 hours. Never ever cover the tattoo with the bandage again after you take off the bandage. Don't make a contact with soap and lotion to your new tattoo. The itch will hit in 4-5 days after inked, don't scratch it, leave the wound peel it self. People will always judge. On the day I got a tattoo, I can count how many people I meet think positively about it. Leave them alone. You are the one who has to live with it the rest of your life. If you want it for yourself, give it to yourself.